President Donald Trump talks with Ajit Pai, Chairman of the Federal Communications Commission, during a Diwali ceremonial lighting of the Diya in the Roosevelt Room of the White House, Tuesday, Nov. 13, 2018, in Washington. Saying there is no legal reason why Ajit Pai should rebuff an invitation to brief lawmakers during the government shutdown, the chairman of the House Energy and Commerce Committee on Monday criticized the FCC head for refusing to appear for a briefing about the ongoing controversy over Americans’ real-time location data being disclosed to unauthorized third-parties. In a call on Monday, Pai’s staff told Democrats that he would not appear to discuss his agency’s progress in tackling the issue due to the shutdown. His presence was requested last week for an “emergency briefing” by the committee’s chair, Rep. Frank Pallone, Jr., who, citing a threat to law enforcement, military personnel, and domestic abuse victims, said the matter could not wait for the shutdown to be resolved. Attention spiked over the phone-tracking issue last week after Motherboard revealed that one of its reporters managed to acquire the location of a cellphone in Queens, New York, through a $300 back-alley deal. The report followed a New York Times story last April that disclosed how phone-location data was being funneled by “middleman” companies from carriers such as AT&T and T-Mobile to law enforcement officials who would otherwise require a warrant to obtain it. Motherboard security reporter Joseph Cox wrote that he had acquired phone-location data from a source in the bail bond industry during the course of an undercover investigation and that the sensitive data was being routinely acquired by bond agents (read “bounty hunters”) without a subpoena or prior approval from the courts. Neither Pai nor his chief of staff, Matthew Berry, placed the call notifying Pallone’s office of his refusal, according to a senior Democratic aide, who said the news came instead from a lower-level staffer. 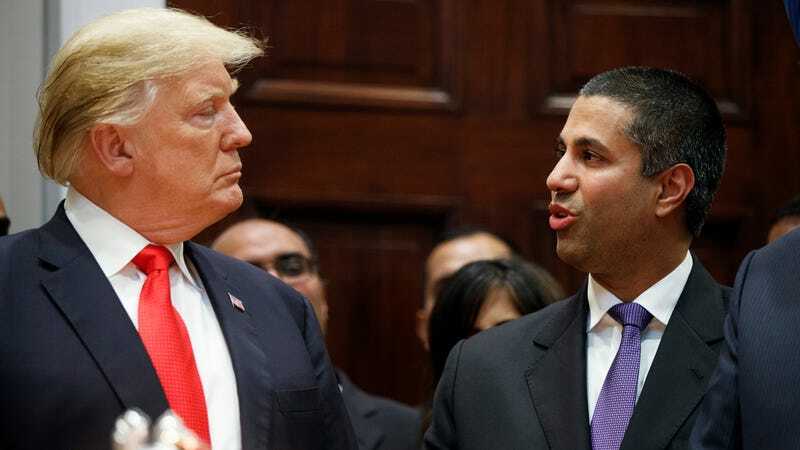 “It’s a new low for someone who has spent his tenure at the FCC refusing to do his job and stand up for American consumers,” he said. Bad actors can use location information to track individuals’ physical movements without their knowledge or consent. If recent reports detailing the cheap, accurate, and easy accessibility of legally protected, real-time location data are true, we must work expeditiously to address these public safety concerns. If we don’t, the privacy and security of everyone who subscribes to wireless phone service from certain carriers—including government officials, military personnel, domestic violence victims, and law enforcement officials—may be compromised. Pallone noted that one of Pai’s colleagues—Commissioner Jessica Rosenworcel—had offered to make herself available to the committee, though she lacks the authority to direct agency resources. “This is an issue of personal and national security,” Rosenworcel, a Democrat, told Gizmodo by phone. “It needs an FCC investigation, the public deserves answers. There’s absolutely no excuse for delay.” She also concurred with Pallone’s assessment that nothing in the law prevents Pai from briefing the committee during a shutdown. “What strikes me most, having spent some time studying this, is that this is a data ecosystem with no oversight,” she said. It’s also very troubling, she said, that wireless carriers, which have legitimate use for location data, have so easily turned it over to “shady middlemen,” who seem to have little compunction about how it used, or by whom. The nation’s other major wireless carrier, Verizon, whose data was not available for purchase in Motherboard’s story, told Gizmodo its ties to the companies were all cut last year. “As you’re most likely aware, Verizon is not among the companies cited in recent media accounts regarding issues with location tracking. We have followed through on our commitment to terminate aggregation arrangements and provide location information only with the express consent of our customers,” a Verizon spokesperson said. Update, 1/15: Added statement from FCC.